Not For Navigation is a solo exhibition of recent work by the Spanish artist Hondartza Fraga. Its centrepiece is ‘365 Globes’ (2015), a set of diminutive drawings of blank earth globes. Each component drawing is identically formatted, with an equally sized, centrally placed globe. Despite the serial nature of the drawings and the conceptual neatness of Fraga’s conceit – one drawing for everyday it takes the earth to turn – the work has none of the austerity typical of conceptual or minimal art. Realistically rendered in pencil, the drawing’s soft tonality lends them a sensuous appeal. Repetition is offset by variation. The globes may be blank but their stands are richly varied. Fraga deploys considerable technical skill in depicting their diverse surfaces of concrete and chrome, polished wood and transparent perspex. The material properties of the globes’ stands are of secondary importance to their metaphoric resonances though. Not for Navigation is an exhibition about the structures and frameworks we put in place to frame and conceptualise the world. 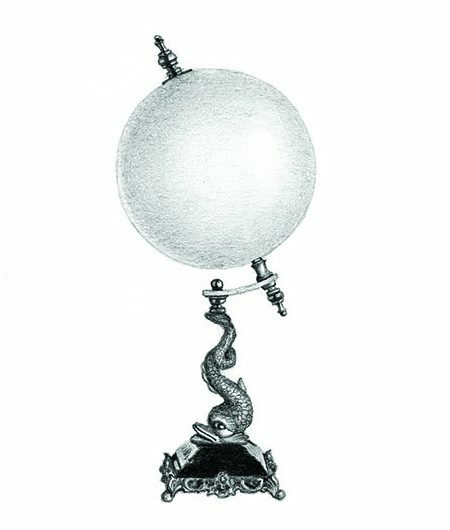 The drawing ‘Blank Orrery’ (2015), for example, depicts an obsolete, clockwork model of our solar system. Built prior to space travel and the discoveries of quantum physics, the eighteenth-century orrery invokes the superseded certainties of a mechanistic science and a philosophical belief that the universe was a giant clock wound by God. Outmoded models of space are also invoked in video landscape ‘Mars was a Place’ (2011). Its soundtrack is a conversation between Fraga and Norwegian artist Markus Lantto about the importance of place. Amongst their poetic ruminations, the pair discuss Percival Lowell’s failed maps of Mars. Lowell confidently claimed to have seen canals on Mars; what he actually saw was a reflection of the veins of his own eye in his telescope lens. It is an anecdote whose terms goes to the heart of Fraga’s concerns with how we (mis)represent the world. Lowell’s confusion of intimate and the infinite are echoed in ‘Dust’ (2016) and ‘Mappa’ (2016). In ‘Dust’ NASA footage of stars is used to create a film that conflates the image of the cosmos with household dust. While in the drawing ‘Mappa’ two hemisphere maps are made to look like doilies. Horizontally placed, ‘Mappa’ emphasises the typical positioning of both dollies and navigational charts, establishing connections between ornament and orientation, female domesticity and male exploration; between self and other, home and elsewhere. When first viewed ‘Mappa’ is difficult to understand. Hemisphere maps are unfamiliar, disorientating. But once understood, the viewer’s first impulse is likely to be to locate their home. For a Spanish artist living in the UK in our present moment, this is no doubt a difficult and topical question. Although clearly unintended by Fraga, who made the works earlier this year, it is hard not to think about them in relationship to recent political events. Borders and belonging are contested issues and Fraga’s un-navigable maps and blank globes generate new meanings against a changing political landscape, their open-ended poetics providing a refreshing antidote to an overconfident, narrow politics. Simon Marginson is a writer based in Leeds. Not For Navigation, The International 3, Salford. 7 December 2016 – 24 February 2017.